And that makes this, in the cinematic masterpiece Lawrence of Arabia, the date on which the titular character kept the peace within his fragile coalition by personally executing a malefactor to prevent a tribal blood feud. a gap-toothed, grumbling fellow, skrimshank in all our marches, bad-tempered, suspicious, brutal, a man whose engagement I regretted, and of whom I had promised to rid myself as soon as we reached a discharging-place. Gasim is most famous as the beneficiary of the movie scene in which Lawrence boldly turns back into the desert to rescue this worthless retainer when Gasim’s camel is found riderless in the caravan. This, too, is based on an actual incident in Lawrence’s memoir, albeit heavily dramatized on celluloid. In the film, Lawrence’s godlike power to give Gasim life is soon mirrored by the godlike power to deprive it. 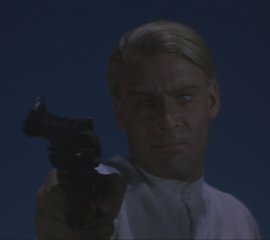 Effectively exploiting dramatic license, Lawrence of Arabia portrays the Englishman surveying the scene of the coming triumph when a disturbance breaks out in his camp. Hastening thither, he discovers clan lining up against clan over the destructive right of blood vengeance because of a murder in the camp — a murder committed by the man he has saved. Though the real Lawrence did no such thing to the real Gasim, this astonishing scene is also related in the memoirs — just at an earlier point, and with a different, less dramatically integral character. My followers had been quarrelling all day; and while I was lying near the rocks a shot was fired. I paid no attention; for there were hares and birds in the valley; but a little later Suleiman roused me and made me follow him across the valley to an opposite bay in the rocks, where one of the Ageyl, a Boreida man, was lying stone dead with a bullet through his temples. The shot must have been fired from close by; because the skin was burnt about one wound. The remaining Ageyl were running frantically about; and when I asked what it was Ali, their head man, said that Hamed the Moor had done the murder. I suspected Suleiman, because of the feud between the Atban and Ageyl which had burned up in Yenbo and Wejh; but Ali assured me that Suleiman had been with him three hundred yards further up the valley gathering sticks when the shot was fired. I sent all out to search for Hamed, and crawled back to the baggage, feeling that it need not have happened this day of all days when I was in pain. As I lay there I heard a rustle, and opened my eyes slowly upon Hamed’s back as he stooped over his saddle-bags, which lay just beyond my rock. I covered him with a pistol and then spoke. He had put down his rifle to lift the gear; and was at my mercy till the others came. We held a court at once; and after a while Hamed confessed that, he and Salem having had words, he had seen red and shot him suddenly. Our inquiry ended. The Ageyl, as relatives of the dead man, demanded blood for blood. The others supported them; and I tried vainly to talk the gentle Ali round. My head was aching with fever and I could not think; but hardly even in health, with all eloquence, could I have begged Hamed off; for Salem had been a friendly fellow and his sudden murder a wanton crime. Then rose up the horror which would make civilized man shun justice like a plague if he had not the needy to serve him as hangmen for wages. There were other Moroccans in our army; and to let the Ageyl kill one in feud meant reprisals by which our unity would have been endangered. It must be a formal execution, and at last, desperately, I told Hamed that he must die for punishment, and laid the burden of his killing on myself. Perhaps they would count me not qualified for feud. At least no revenge could lie against my followers; for I was a stranger and kinless. I made him enter a narrow gully of the spur, a dank twilight place overgrown with weeds. Its sandy bed had been pitted by trickles of water down the cliffs in the late rain. At the end it shrank to a crack a few inches wide. The walls were vertical. I stood in the entrance and gave him a few moments’ delay which he spent crying on the ground. Then I made him rise and shot him through the chest. He fell down on the weeds shrieking, with the blood coming out in spurts over his clothes, and jerked about till he rolled nearly to where I was. I fired again, but was shaking so that I only broke his wrist. He went on calling out, less loudly, now lying on his back with his feet towards me, and I leant forward and shot him for the last time in the thick of his neck under the jaw. His body shivered a little, and I called the Ageyl, who buried him in the gully where he was. Afterwards the wakeful night dragged over me, till, hours before dawn, I had the men up and made them load, in my longing to be set free of Wadi Kitan. They had to lift me into the saddle. Peter O’Toole’s Lawrence almost palpably manifests the conflicting aspects of his character as he shoots Gasim to death — and he confirms the transformative effect of his first homicide in subsequent dialogue with Gen. Edmund Allenby. Lawrence: I killed two people. One was … yesterday? He was just a boy and I led him into quicksand. The other was … well, before Aqaba. I had to execute him with my pistol, and there was something about it that I didn’t like. Allenby: That’s to be expected. Allenby: Well, then let it be a lesson. Lawrence: No … something else. * Actually, Aqaba is Jordan’s only port. This battle was not so epic as the film depicts.